Poklonnaya Gora, or the Hill of Respectful Salutation occupies a special place in the history of Moscow. The 19th century Moscow historian Ivan Zabelin described Poklonnaya Hill as “the most memorable place in the Russian history”, a truly sacred area. If translated literally, the word “Poklonnaya” derives from “poklon” or “bow”, a Russian gesture to pay respect to a person or object of high reverence. Poklonnaya Hill served a good stopover place for travelers and played host to foreign guests. Many glorious and tragic chapters of Russian history are connected with Poklonnaya Hill. The necessity to commemorate the deed of Soviet people in the Great Patriotic War became clear well before the end of the war, after the Red Army won its first major victory near Moscow. A monument to commemorate the Victory was deemed as a necessity in the course of preparations for Moscow’s 800th birthday in 1947. Several years later the authorities took a decision to build such a monument on Poklonnaya Hill. On February 23rd 1958 they installed a granite plaque with the inscription “A monument to commemorate the Victory of the Soviet people in the Great Patriotic War will be erected here” and laid out a park, which they called Victory Park. Next they called a tender for the best project of the monument. “The entire nation participated in the construction of the monument. The project took on a nationwide dimension. There wasn’t a single family unaffected by the war – each had at least one member killed or wounded. Reminiscences of the war are still fresh in the hearts of people. People worked Saturdays for free as a form of contribution to the construction of the monument. A sum, which equaled about 320 million dollars was raised. A fairly huge sum,” says Nikolai Yakuba. The memorial complex on Poklonnaya Hill was completed in the mid-1990s. The inauguration ceremony took place on the 50th anniversary of Victory-in-Europe-Day, on May 9th 1995. In the years of its existence the Victory Monument has earned widespread recognition of both Russians and foreign visitors. Here are some of the comments from the Visitors’ Book. And the following opinion comes from a delegation of the Control Ministry of China. The War Memorial on Poklonnaya Hill has become a symbol of our victory in the fiercest of wars, a monument to the heroism of the Soviet people, which made this victory possible. The Great Patriotic War of Soviet people against the Nazi aggressor began on June 22nd 1941 and ended on May 9th 1945. Since then May 9th has been celebrated here as Victory Day, or Great Victory Day, as people in Russia call it. War veterans arrive on Poklonnaya Hill early in the morning to meet their former comrades-in-arms and pay their respects to the memory of those who perished in the war. On Victory Day the territory of the complex is filled with thousands of Moscow residents and visitors to the capital of all ages and walks of life. The heroism of Soviet people in the war against Nazi Germany is reflected in the exposition of the Central Museum of the Great Patriotic War on Poklonnaya Hill. The Museum, which opened in 1995, is the central part of the Victory Complex. It, in fact, comprises several expositions, including the War History Exposition dedicated both to pre-war years and the war itself. It also includes a set of dioramas on the major battles of the war – from the defense of Moscow in winter 1941 to the fall of Berlin in spring 1945. The memorial section of the Museum is the Hall of Glory where there are marble slabs engraved with the names of participants of the war awarded the honorary title “Hero of the Soviet Union”. Originally there were more than 11 thousand of them, and the list is replenished all the time as archival work progresses. Part of the War Memorial on Poklonnaya Hill is an open-air Weaponry and Fortification Exposition. It begins with specimens of German armaments advancing on the Soviet line of defense. The defense line was built by military engineers on authentic drawings, and serving a model was a strip of land where the Battle of Kursk, one of the fiercest battles of the Second World War, took place in July-August 1943. On display in the Victory Park are an Exposition of the Navy and the Railway Forces, specimens of artillery guns and aircraft. Apart from that, the Park boasts a complete collection of armored vehicles – from light tanks of the early war years to heavy models, which fought in Berlin in 1945. The War Years Alley leads to the center of the complex – Square of Victors. And radiating from the square are ten alleys of the Victory Park, each of them has a name of its own, among them the Alley of Defenders of Moscow, the Alley of Memory, the alleys of soldiers, partisans, and sailors. Veterans of the Great Patriotic War traditionally meet on the Alley of Veterans. The nearest metro station, Park Pobedy, or Victory Park, was launched into operation in May 2003 to become the 165th metro station in Moscow and the deepest one in both Moscow and Russia. The interior of the station, dedicated to the glory of Russian weaponry, abounds in panoramic panels with scenes of the 1812 Patriotic War against Napoleon and the Great Patriotic War of 1941-1945. The Memorial Complex on Poklonnaya Hill reflects the Great Patriotic War as the tragedy of many peoples, which is particularly relevant for Russia with its numerous nationalities and confessions. 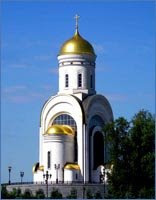 That’s why part of the Victory Park are the Orthodox Church of Great Martyr and Victory Bearer St.George, the patron of Moscow, the memorial Mosque and the Memorial Synagogue to memorize people of different religious beliefs who perished in the war against the Nazis. A tradition that sprang up in the post-war years is that the newlyweds should lay flowers to the monuments to fallen heroes, including on Poklonnaya Hill. The question many of our listeners repeatedly ask is why there is such a tradition in this country. This explanation was provided by one of the visitors to the Victory Memorial: “People come to pay tribute to the memories of those who lost their lives on the battlefield. They know they owe it to the fallen heroes that they live, get married and come here,” said a 17-year-old Moscow student. One of the alleys in the Victory Park is the Alley of Newlyweds. The newly married couples arrive here right after the marriage ceremony to lay floral tributes in the Hall of Memory and Sorrow and in the Hall of Glory in deep reverence to those whom they owe the peace they’re living in. “This is my third visit here. The landscape is so beautiful, the flowers everywhere, the church, the architectural structures – all are just marvelous beyond description,” said Yelena, who came to Moscow from Ukraine. Another local wonder that greets visitors right at the entrance to Poklonnaya Hill is the world’s biggest flower clock, which has been included in the Guinness Book of Records. The clock-face is laid out from some 8000 flowers.